I am back! I am taking advantage of this Spring break to catch up with all the cool events and activities that have been taking place in T.A.L.K. at Pioneer. I will try to be consistent every week up until the end of T.A.L.K. which is sadly approaching! NOOO! Week 17 marked the beginning of the second semester with a few new faces and some that will be missed. 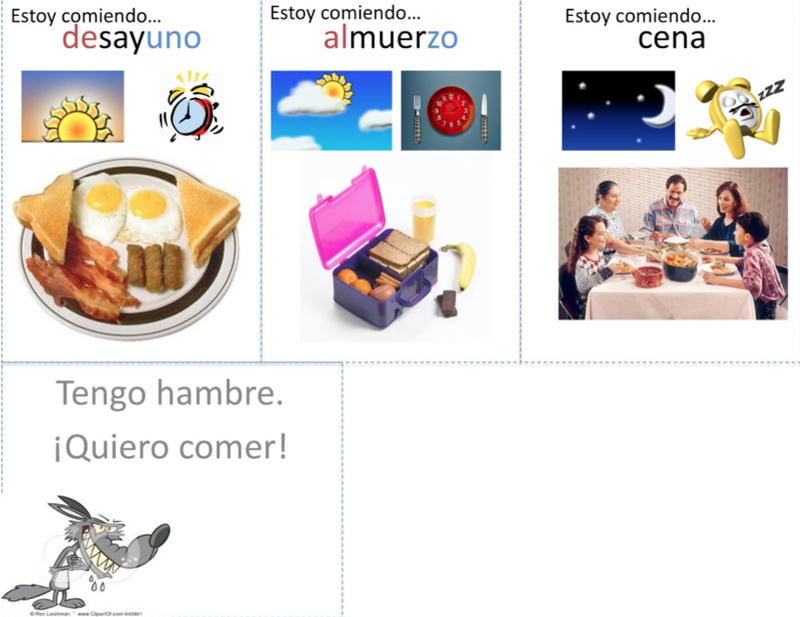 During this week the kids reviewed their fruits & vegetables, as well as, learned about the meal periods in Spanish. The kids had the chance to provide examples of each meal period. Some had various differences when it came to dinner time due to their cultural backgrounds. I even shared that for lunch, in Mexico, "tortas" are like the sandwiches we eat here in the U.S. but they are bigger! We then played a game called "El juego del lobo" (The wolf game). The purpose of the game is not to get eaten by the wolf. The bottom four images are cards that were cut out and put into a folder. Without looking the person in the middle who is supposed to become the wolf at some point, picks one out and has to read it out loud. The rest of the group, who are forming a big circle around the wolf, must repeat what the wolf said. However, when the person in the middle gets the wolf card that is the moment he/she becomes the wolf and therefore reads the card in a menacing deep voice as if they were a wolf in reality. The cards translate as the following: I am eating…breakfast, I am eating… lunch, I am eating… dinner, and (FINALLY the wolf card) I am hungry… I want to EAT!! Then everyone runs away from the wolf. If caught, then that person became the person in the middle. 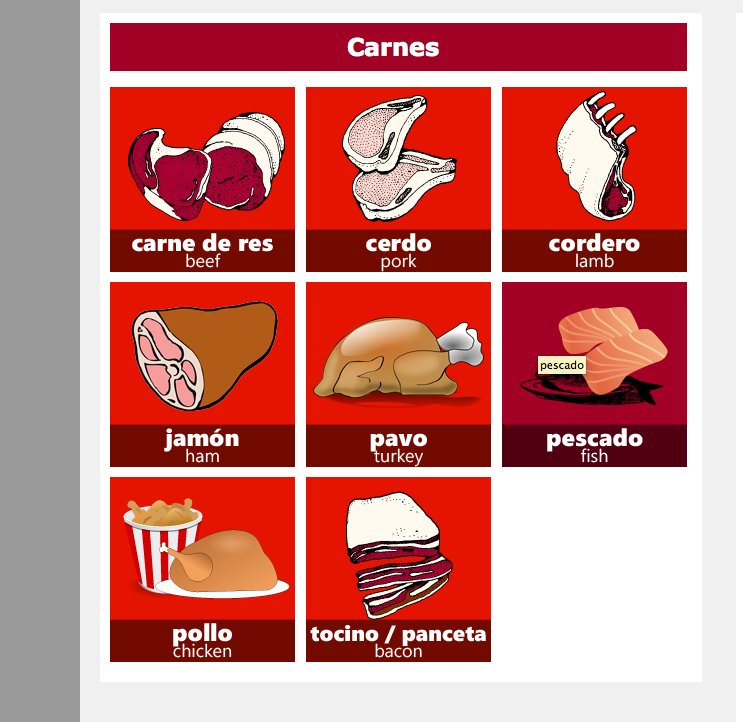 For week 18, the kids learned about the meats (carnes) and dairies (lecheras) in Spanish. They were shown the image below and then discussed as a class the English translations to them to become a bit familiar with what they've eaten in the past. We then transferred over the new vocabulary to the post-its on the white board. 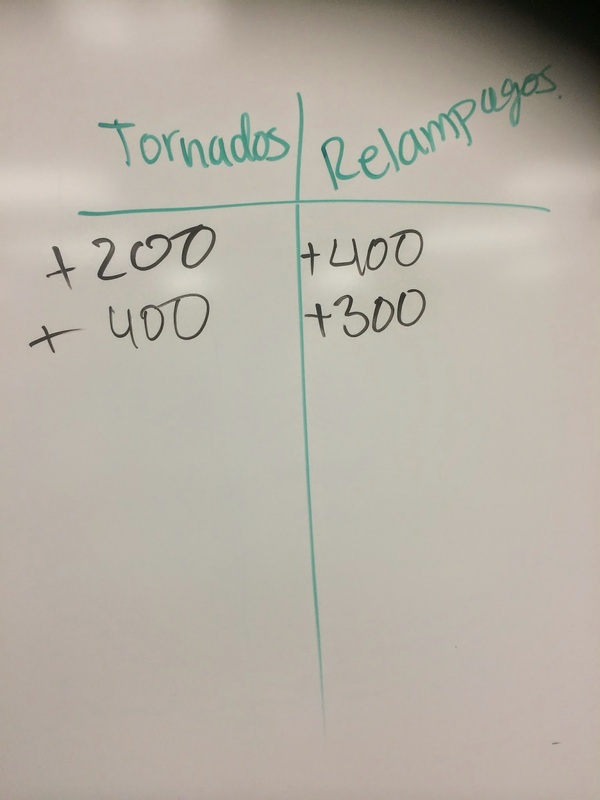 The next activity included some racing to the back of the classroom to correctly paste the post-its in their right category on the Food Pyramid under two minutes. They did an awesome job! The last activity of the week was to celebrate "El Día de San Valentín" (Valentines Day) by making heart shaped animals to take home to parents wishing them a Happy Valentines Day. 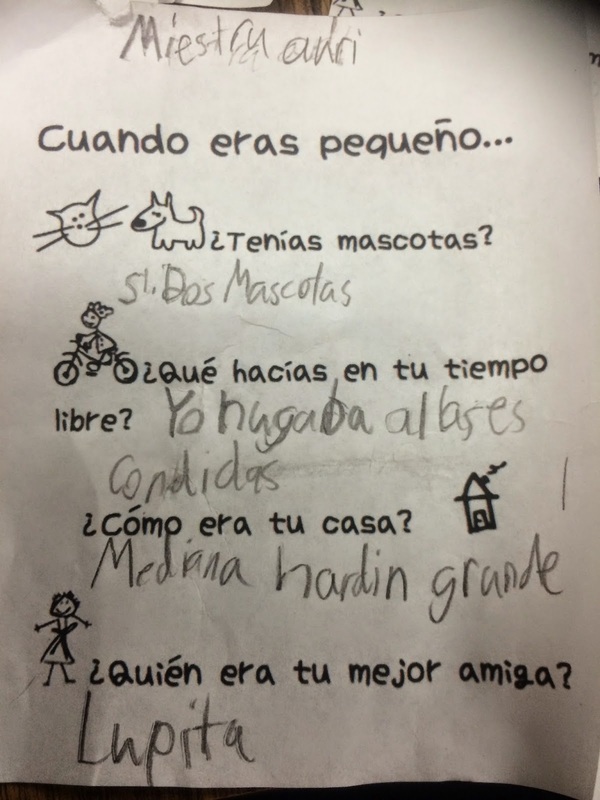 This was also so that they review their animals in Spanish. The kids were assigned to a station which was to make either a "Zorro" (fox), "Ranita" (Frog), or "Caracol" (Snail). As a big reward for their awesomeness, they were given treat bags with lots of small toys. 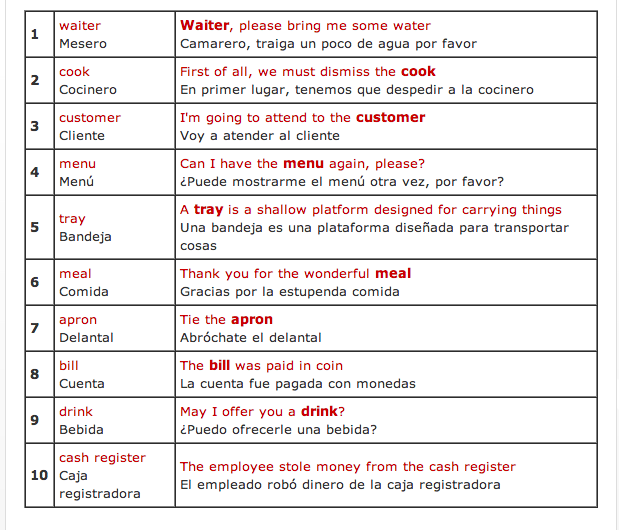 For week 19, the kids learned how to order food in a restaurant in Spanish. Each student was assigned a role of meseros (waiters), clientes (clients), or cocineros ( cooks). 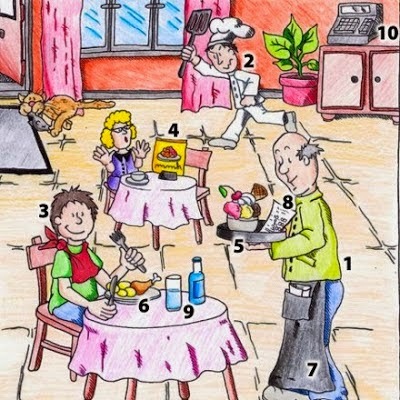 They were, first, taught the vocabulary by studying the image below of the restaurant scene to become familiar with what you'd typically find in a restaurant in Spanish. 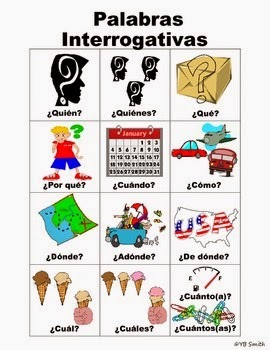 They were then taught small phrases of how to order food in Spanish like the following: "Me da ____ por favor"(Can I have the ____ please), "me gusta"(I like it), "no me gust"( I don't like it). Here the kids played a game of Jenga with the restaurant and food vocabulary. As they took a block out of the structure, they were to read the spanish word out loud and then give the english translation. Let's play restaurant! The kids took on their roles and began exercising their responsibilities as if they were in a restaurant. The waiter introduced herself to the client. Here the cooks were getting their ingredients ready. The clients were getting ready to order their food after reading the menus. The waiters were preparing the drinks for their clients. The cooks began making the food. The clients received their drinks and were now waiting for their food. In the kitchen, everything was running smoothly. Working on the presentation of their dishes. The food was ready to serve! For week 20, the kids learned how to follow a recipe in Spanish. How to make bread, was the recipe chosen. The kids began their week by viewing the video below in Spanish many times to become familiar with the process. Once they knew exactly what ingredientes (ingredients) they were going to need and how to preparar (prepare) the masa (dough). They were off! For week 21, the kids reviewed previous topics like the foods, body parts, and how to be waiters. They played Simon Dice! (Simon Says…) They were divided into three teams. Here are some of their drawings that were captured during the game. 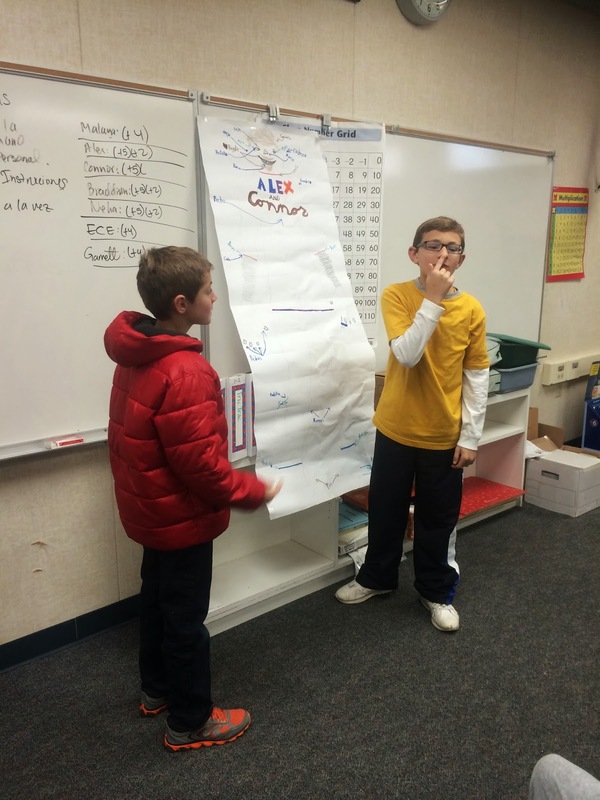 Here we have two of our awesome brothers reviewing the body parts using their poster created earlier in the year. After reviewing the body parts, we played a fun game called "Huesitos" (small bones). This game was introduced to us by a teacher who taught for many years and was with us last year. Very interactive and creative. Basically, we have the kids pick partners whom they feel comfortable with to play this game. The purpose is to test if they know their body parts by demonstrating the location using their body. One is chosen to be the leader and the other the volunteer. The teacher dictates the task. Examples are provided below. The teacher says for instance, "Pierna a cabello" (leg to hair). The leader does the first action. Then, they with roles. For the next one, "Mano a nariz" (hand to nose). The other kid has to carry the action by placing his/her hand in the other person's nose. The team to detach will be detaching the small bones and looses that round. 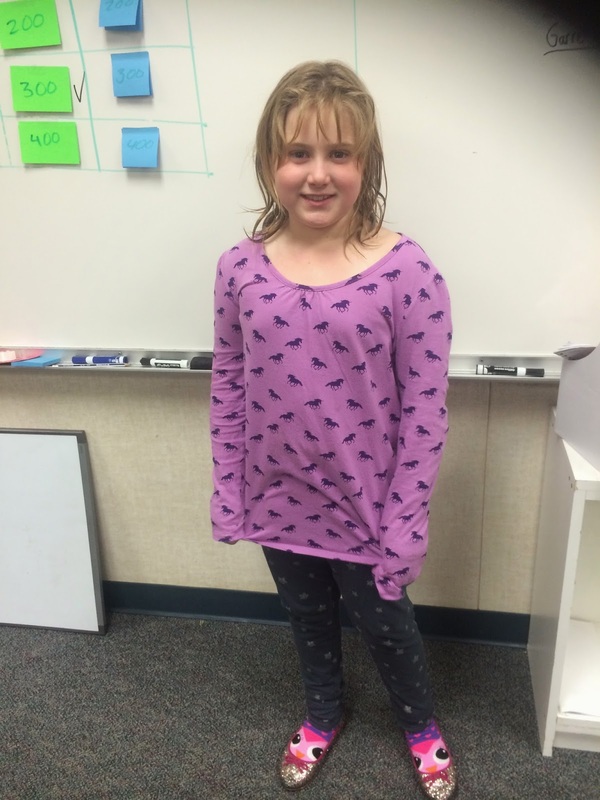 They had fun and it helped them practice their vocabulary. The kids then played a game of "Waiters"(Meseros) Here they were responsible for making their own pieces of food with play-doh and then transporting each piece to the second location using either a spoon (cuchara), fork (tenedor), knife (cuchillo), and chop sticks (Palillos). If they dropped the food they had to start all over. The first person to transport all the pieces, wins! Then we twisted things up! We added a complicated path! 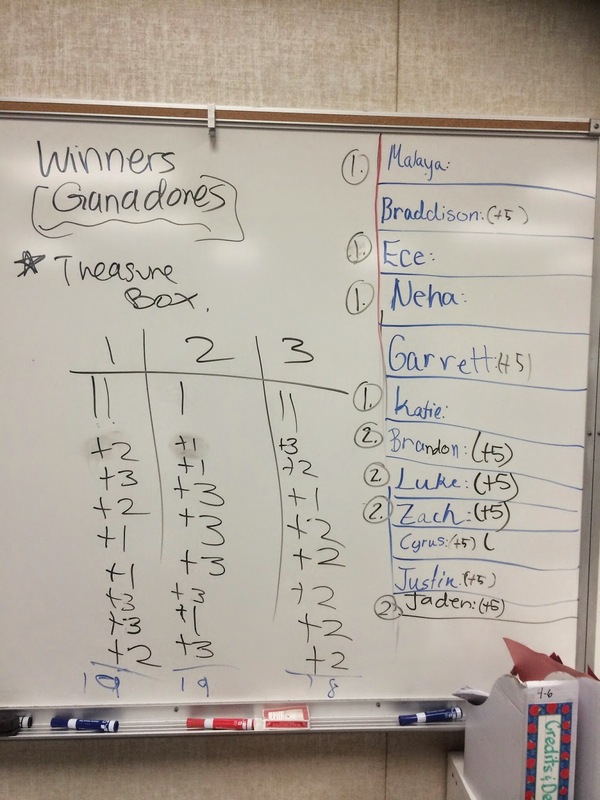 These champs stayed after class to challenge Maestra Auri! 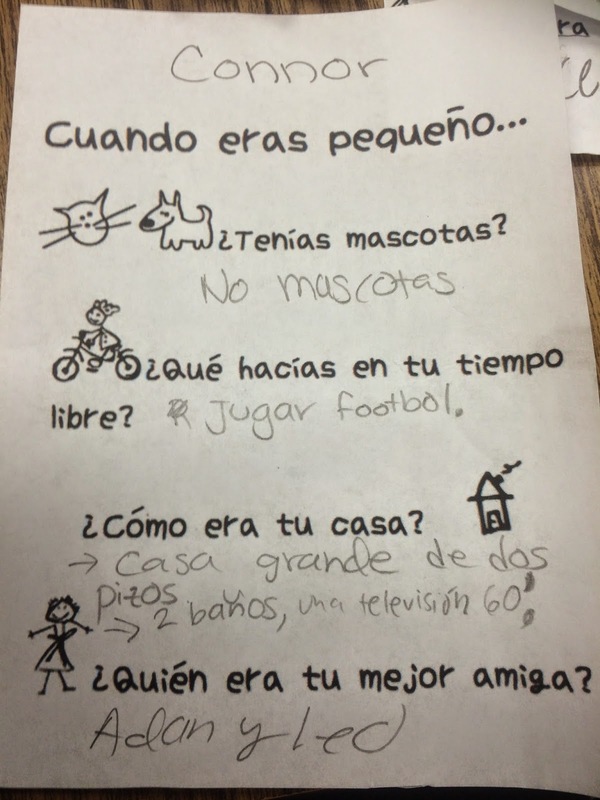 For week 22, the kids learned how to ask basic questions in Spanish. Using this simple and short questioner. The kids engaged in a game of Jeopardy reviewing the basic questions: who (quién? 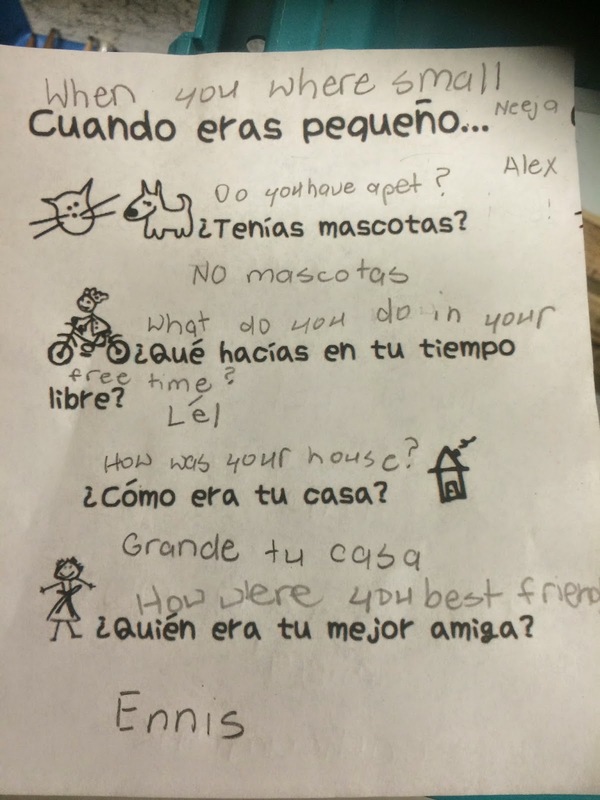 ), what (qué? 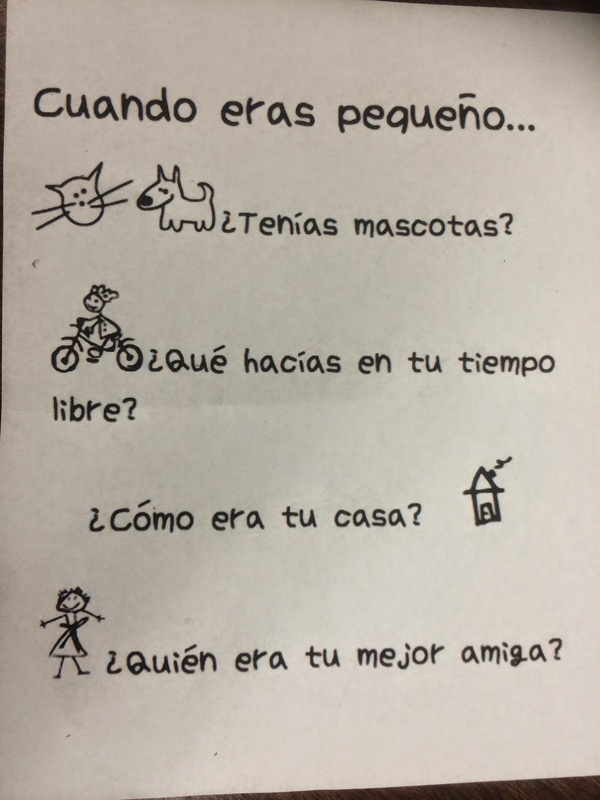 ), when (cuándo? ), where (dónde? ), why (Por qué? ), how (cómo? ), how many (cantos? ), whom (quienes?) They were shown spanish clips to movies in Spanish and they were responsible for answering the questions for each category under each movie for points. For weeks 23 and 24, the kids worked on practicing asking questions in Spanish by playing Simon says and reading to the board for points. They also, were shown powerpoint images like the attached below image.